What is the best professional DJ controller money can buy? In this article, I would like to explore a selection of high-end controllers available today in the DJ market. 2016 was an interesting year when it comes to the DJ controller market. The trend to include LCD screens into DJ controllers continues, but also to make them independent from computers. 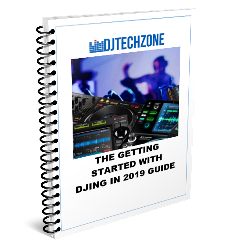 Manufacturers are working hard to tie their hardware as tightly as possible to the DJ software of their choice, be it for performance or preparation purposes. Pioneer DJ has Rekordbox, Denon DJ has Engine and Engine Prime and Serato plays nice with a whole host of hardware manufacturers. But can DJ controllers be professional? Those are a few of the most important characteristics of a professional level DJ controller. With that in mind, let’s dive into a selection of currently available models, and I will give you my top recommendations. Native Instruments Traktor Kontrol S4 MK3: A great update of the previous MK2 iteration, with motorized jog wheels, haptic feedback and a built-in LCD screen to check track data! Pioneer DJ DDJ-RZ Rekordbox DJ Controller: The DDJ-RZ is big and fully featured. It might have a lost a bit of attraction with the arrival of the DDJ-1000, but it’s still a fantastic piece of equipment. Pioneer DJ DDJ-RX Rekordbox DJ Controller: Compact yet fully featured, the DDJ-RX is a good (and cheaper) alternative to the DDJ-RZ. Roland DJ-808 Serato DJ Controller: A powerful unit with fantastic jog wheels and a built-in sequencer/drum machine! 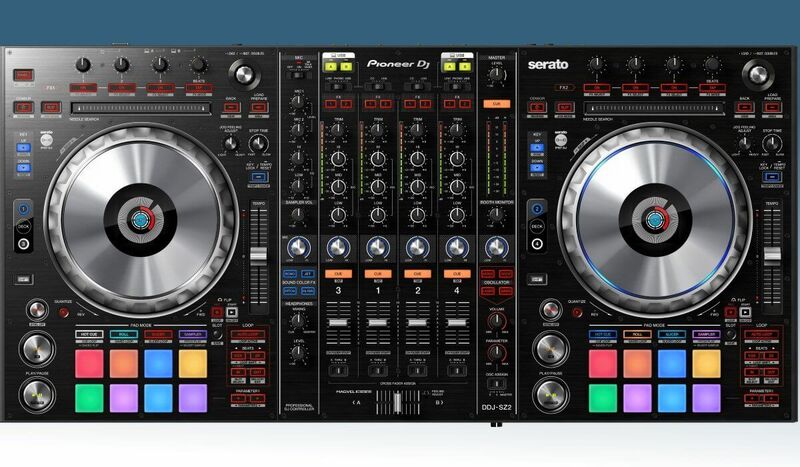 Pioneer DJ DDJ-SZ2 Serato DJ Controller: Similar to the DDJ-RZ, but built for Serato DJ. 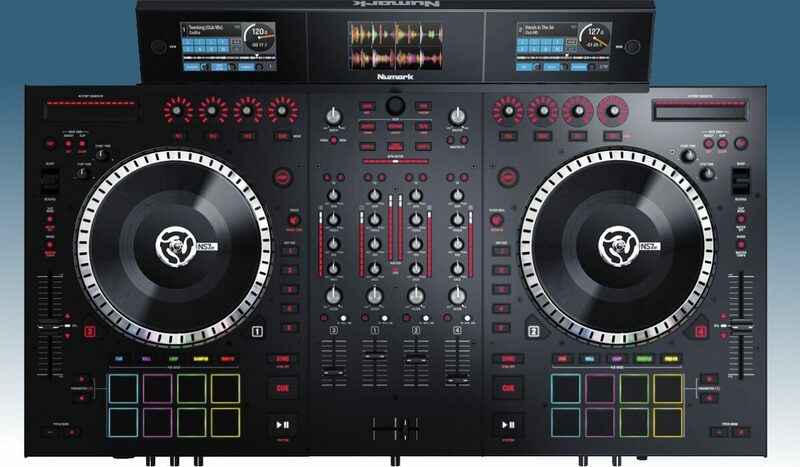 Numark NS7III Serato DJ Controller: Fantastic DJ controller with moving platters, real vinyl, and 3 onboard screens. Pioneer DJ DDJ-RZX Rekordbox Video Controller: Very expensive and resource hungry, but functionality wise superior to all the rest. 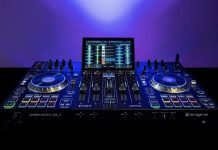 Pioneer DJ DDJ-SX3 Serato DJ Controller: Similar tot he DDJ-RX, but built for Serato DJ. Native Instruments Traktor Kontrol S8: The best professional solution to DJ with Traktor Pro at the moment. The Pioneer DJ DDJ-1000 is probably the very best DJ controller at the moment. It looks, feels and acts like two CDJ-2000NXS2’s and a DJM-900NXS2 mixer glued together. At a little more than USD 1000, it’s also very affordable considering everything you are getting. The DDJ-1000 marks a departure from the traditional DJ controller design from Pioneer DJ and their Serato DJ controller line. The most remarkable thing is that the decks mirror actual CDJ decks, with the typical yellow loop buttons on top. The jog wheels are not only very similar to the ones of the pro-level CDJ-2000NXS2, they have large LCD screen built-in that show all relevant track information, including waveforms. The mixer is really a mini-DJM-900NXS2. 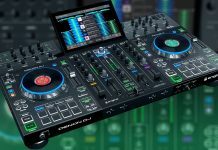 It has 4 built-in sound color effects and 14 beat effects that are available even if connected with external sound sources such as turntables or media players. The layout mirrors that of the pro-level mixer and that’s a great thing since it will make it easier for DJ’s to transition from this to professional club setups. If you are ready to use Rekordbox DJ, then the DDJ-1000 is the best DJ controller your money can buy. I would even say, it’s so good that it might be a good reason to consider switching from other DJ software. The Native Instruments Traktor Kontrol S4 MK3 is more than a worthy update to the previous iteration, adding haptic feedback and motorization on the jog wheels. The onboard mixer effects and the small LCD screens give a standalone feel, but you still need a computer to use it. The Traktor Kontrol S4 MK3 is definitely a very interesting update to the Kontrol S4 MK2. The controller was re-designed from the ground up, and the differences are many. The S4 MK3 has, surprisingly enough, motorized jog wheels. Not only that, but they also have haptic feedback. This means that it’s possible to feel cue points when moving jogs around, which helps to find your cues in a much more intuitive way. Not bad for a company that was determined to kill the jog wheel with the release of the Kontrol S5 and the Kontrol S8. With an extensive amount of input & outputs and support for DVS, the Traktor Kontrol S4 MK3 is compact enough to carry around from gig to gig but also well featured enough to be used by professional DJ’s. Big and expensive, but very close to a professional DJM+CDJ experience at less than half the price. The RZ is a huge beast. 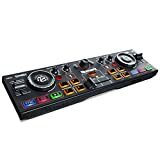 It features CDJ sized jog wheels with center LCD display, a 4 channel hardware mixer with integrated sound color effects, professional-grade inputs & outputs on the back and double USB inputs for easy DJ changeovers. The RZ has a hardware mixer as well, which allows connecting CDJ’s and turntables to it. Essentially, it’s the closest a DJ controller comes (except for the DDJ-RZX) to emulate a CDJ/DJM setup. 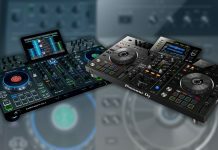 The price, although being high (around USD 2.000), is acceptable knowing that a CDJ/DJM setup will set you back at least double the amount for essentially fewer features (you would be missing the performance pads for example). 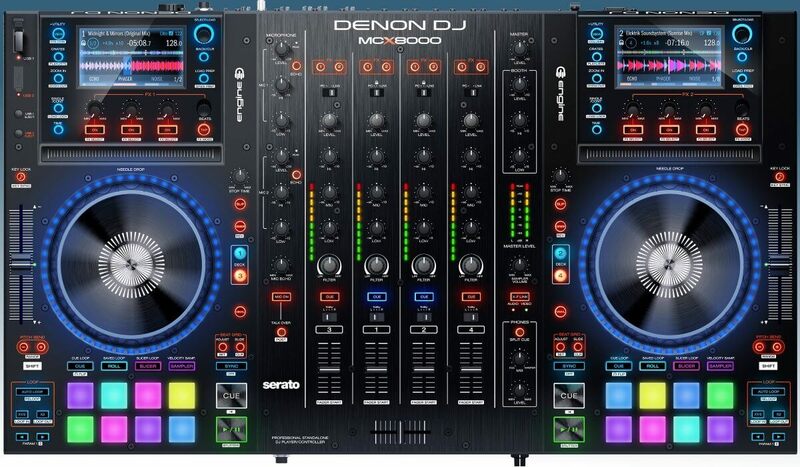 The Denon DJ MCX8000 is the only 2-in-1 on the market: it can work as a professional Serato DJ controller but it’s also a standalone Denon Engine DJ controller that works USB drives! Fully featured Serato DJ controller and a standalone USB media player in one. Extensive I/O and double mic input. Big controller to carry around. The standalone mode works best when the music files are analyzed & prepared in Denon’s proprietary Engine software, but it also does work with files that didn’t pass through Engine. While Engine is no match for Rekordbox (yet), it does get the job done of beat gridding your music. The screens are good but not great. They are clear enough but are not a match for the screen on a CDJ-2000NXS2, or Denon DJ’s own SC5000 Prime media players. But they are good enough and should help DJ’s stay focused on their crowd & gear instead of starting constantly at their laptops. Price-wise, the MCX8000 hits the mark, considering all the features. 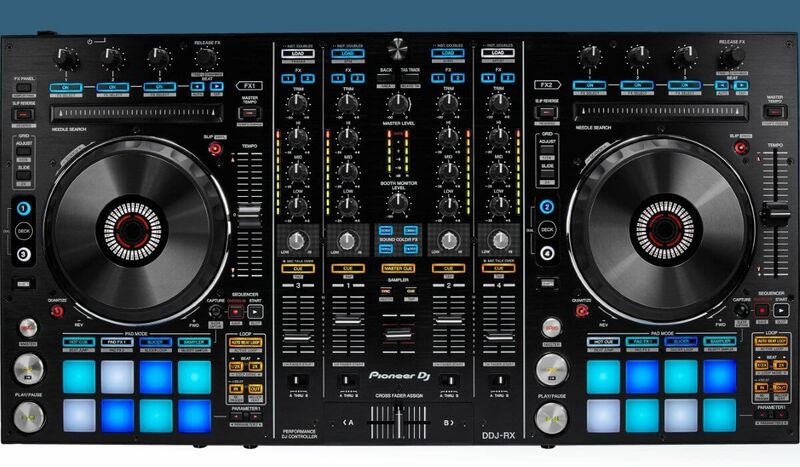 The only stand-alone unit I can think of that more or less compares to this is the XDJ-RX from Pioneer DJ, which costs around USD 1.500. Fully loaded and reasonably sized, the RX is (almost) the perfect Rekordbox DJ controller. Support for all the advanced performance features in Serato DJ. As with the DDJ-RZ and the DDJ-SZ discussed above, we have a very similar situation with the DDJ-RX and the DDJ-SX2. The SX2 is the Serato DJ version, the RX the Rekordbox DJ version. Both have almost identical features, except for, you guessed it, hardware support for Rekordbox Sequencer for the RX and Serato Flip for SX2. Choosing one over the other is a matter of software preference. Rekordbox DJ is very powerful software and although not as established as Serato DJ, it’s built on top of Rekordbox and as such works on the same music library so you can be playing from USB in clubs and from Rekordbox DJ at home without having to prepare your music twice. This is a clear advantage Rekordbox DJ has over Serato DJ and in time, should make it the more popular DJ software choice. Apart from all that, the DDJ-RX has a fully independent hardware mixer, professional grade inputs & outputs, fantastic jog wheels and a very solid build. Highly recommended, and a top contender for the title of best professional DJ controller. Channel source switch on the front of the controller is a bit cumbersome to operate. The first DJ controller to combine a DJ controller with a voice transformer and a drum machine/step sequencer. The Roland DJ-808 is the first DJ outing from Roland in a long time, and they are not kidding around. The DJ-808 is not only a fully featured controller for Serato DJ, it also has a sequencer, drum machine, and vocoder build right in. And all that for USD 1.499. This controller will appeal to those DJs/producers that want more than just playing and mixing pre-recorded music. Using the sequencer/drum machine it’s now possible to create original sound patterns right in Serato DJ using the DJ-808, and with the Ableton Link integration with Serato DJ, hooking up with other devices that use Link as well is now possible and easy to do. In my opinion, the DJ-808 is worthy runner-up for the title of best professional DJ controller out there. I still would place the MCX8000 above it, because of its built-in screens and its stand-alone capability. The message is quite simple here: if you use Rekordbox/Rekordbox DJ and have no need for any other DJ software, go for the DDJ-RZ. If you are a Serato DJ user and might use Rekordbox alongside, go for the DDJ-SZ2, since the SZ2 will for sure be made compatible with Rekordbox DJ. 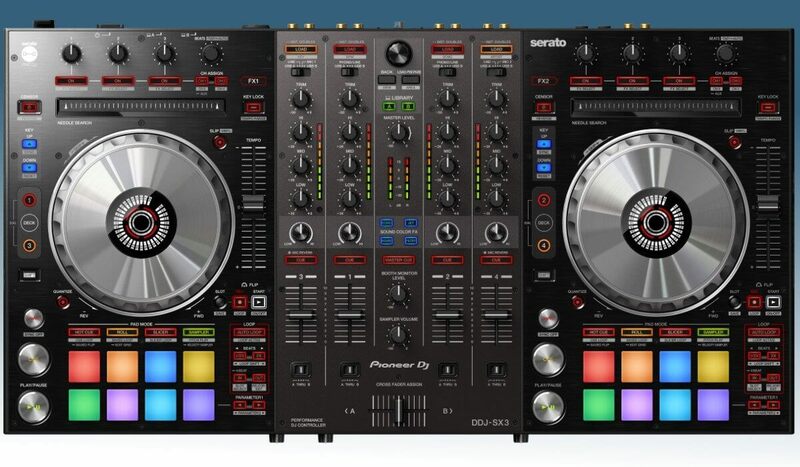 The feature list of both controllers is quite similar, with some small differences: the RZ has support for the Rekordbox Sequencer feature (Pioneer DJ’s version of Serato Flip) and the DDJ-SZ2 supports Serato Flip. But that’s about it. 3 built-in screens, motorized platters, the NS7III is a beast in the best possible sense of the word. The Numark NS7III is in many ways comparable to the DDJ-RZX, since it’s also a 4 channel controller, and it has 3 screens. There a few important differences though. First of all, the price. The NS7III is half the price (!) of the DDJ-RZX. That is a big difference. The screens on the NS7II are smaller and lower resolution (they don’t support video for instance) but at half the price that is an acceptable compromise. Secondly, the NS7III is a Serato DJ controller, and won’t work with Rekordbox DJ, in the same way, the RZX won’t work with Serato DJ. And finally, the NS7III lacks the double USB ports of the RZX. It does have one big thing that might be a decisive factor: it has rotating platters that use real slip mats and real vinyl. The NS7III is the closest you can get to a mixer and turntables using a midi DJ controller. Beyond pricey, but at the same time offers a true CDJ+DJM experience. Laptop is still required. 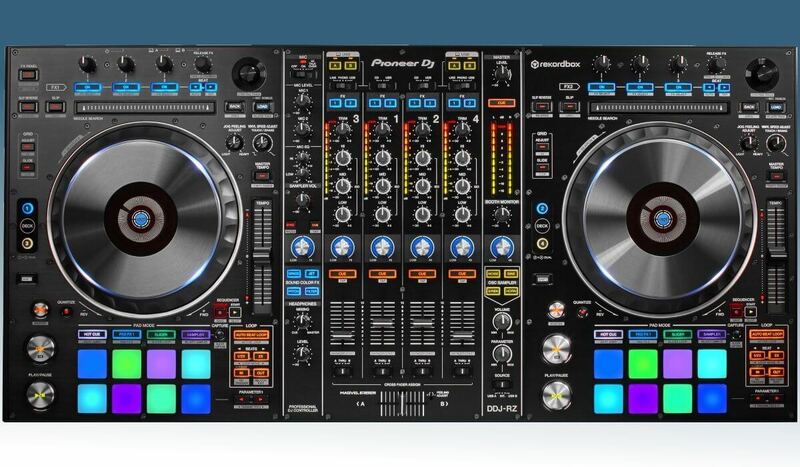 You will definitely need a very recent machine to work smoothly with the DDJ-RZX, so it’s important to take that into account when considering a purchase. The main flaw here is that for all the raw power the RZX offers, it cannot work in standalone mode. 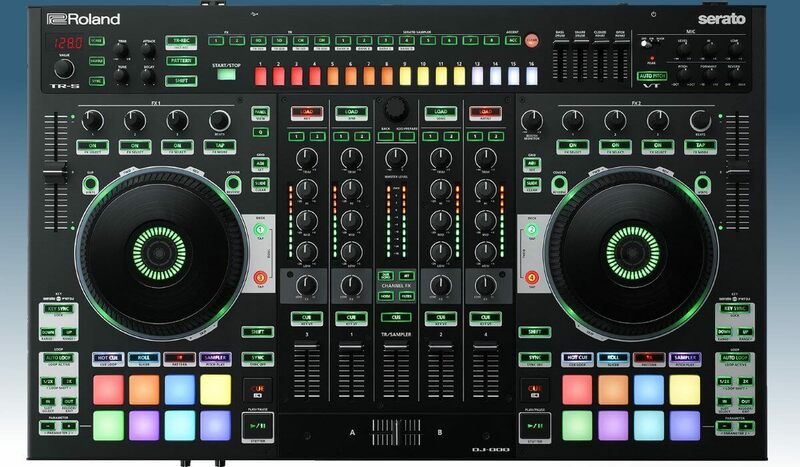 If this would be possible, the RZX would be the absolute number 1 DJ controller out there. Apart from screens and video support, the RZX is pretty much the RZ on steroids, with added color FX, dedicated MIC FX. Could the RZX be the best professional DJ controller, since it’s the most expensive of the lot? Not really. 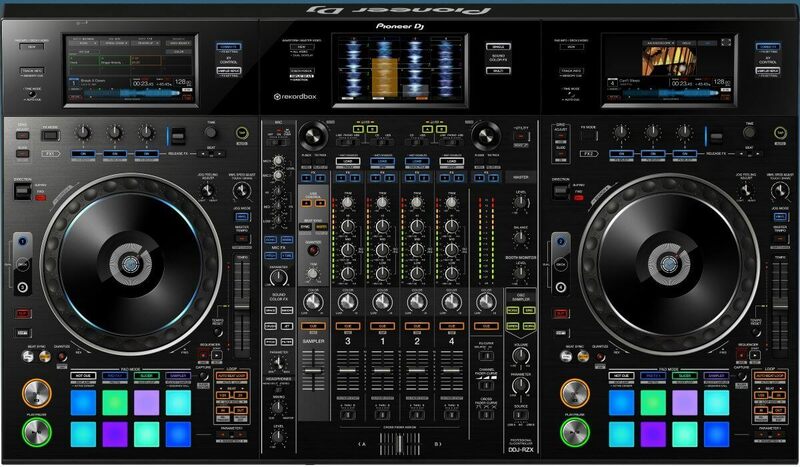 A DJ controller assumes at least a bit of portability, and this enormous beast will be very hard to move around. The dependency of a computer also makes it a less appealing choice for pro DJ’s. Lack of standalone capacity is a big miss, considering the price. Needs a heavy spec laptop to operate (especially video features). Fully loaded and reasonably sized, the SX3 is (almost) the perfect Serato DJ controller. 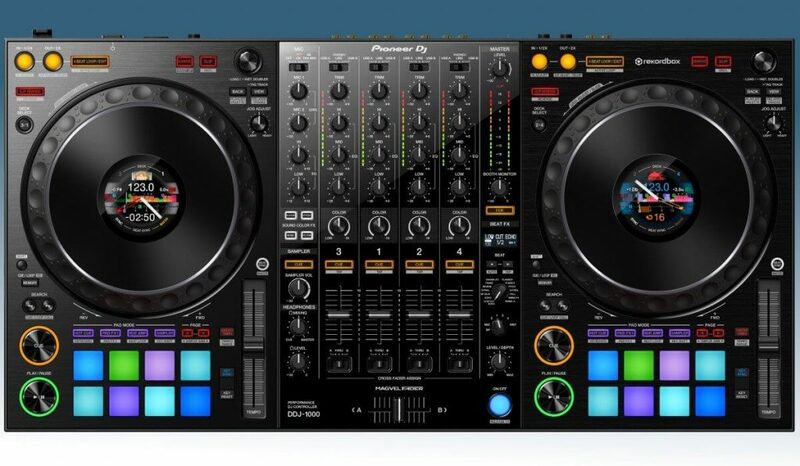 The Pioneer DJ DDJ-SX3 is the updated version of the second generation DDJ-SX2 DJ controller. 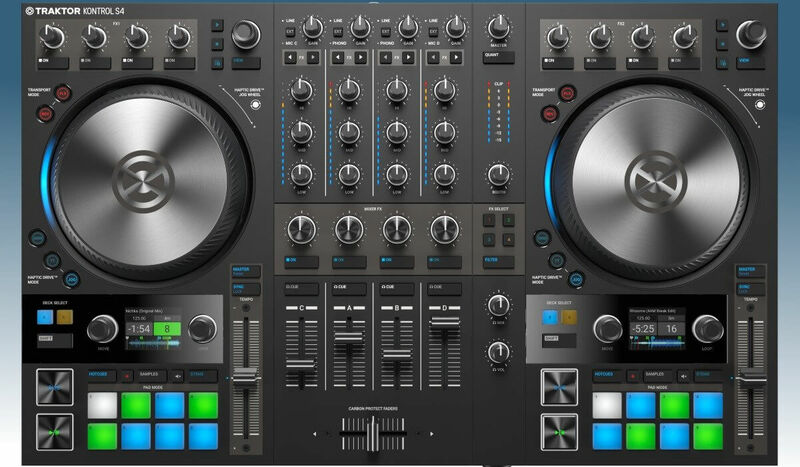 It has very similar features to the DDJ-RX discussed above, including the onboard sound color effects. One advantage over the DDJ-RX is the compatibility with Rekordbox DJ next to Serato DJ so if you are planning to use both or are unsure what you will end up using, the DDJ-SX2 is a more sensible choice. What I really like here is that the channel switches are not located in the front, but on top of each channel itself, making it much more easier to switch sound sources. Fantastic controller for Traktor Pro, but it does force you into a workflow without pitch faders and jog wheels. Hardware mixer with DVS support. The Traktor Kontrol S8 is not a new controller, it came it out almost 2 years ago. But with the recent Traktor Pro update to version 2.11 things got more interesting for Traktor Pro users: Ableton Link is now integrated with Traktor Pro and the remix decks can now function as sequencers. 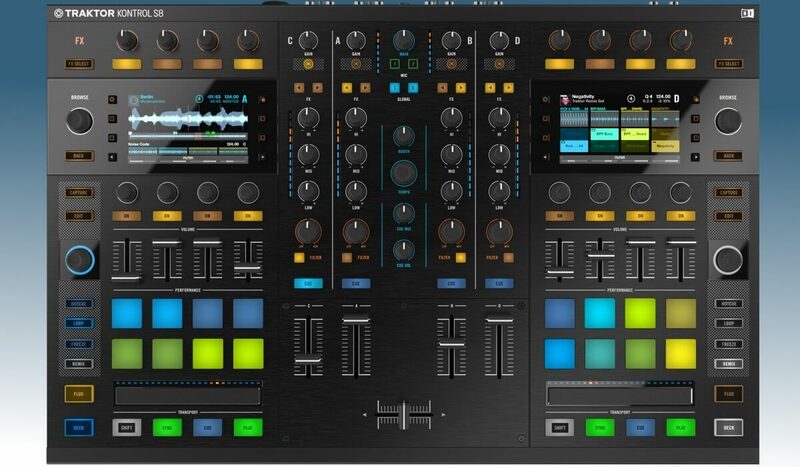 Apart from that, the S8 has built-in high-resolution screens, a hardware mixer, full support for Stems with 4 channel faders per deck. There are no jog wheels in sight, but the touch strips do a good job of replacing them (you can nudge and even scratch with them).